Call me naive (although I’d prefer it if you called me Donna*), but I didn’t even realise until this week that postal officers could refuse to deliver mail that they deemed offensive. But they can, and they did, when they were handed the latest issue of marketing magazine The Drum. 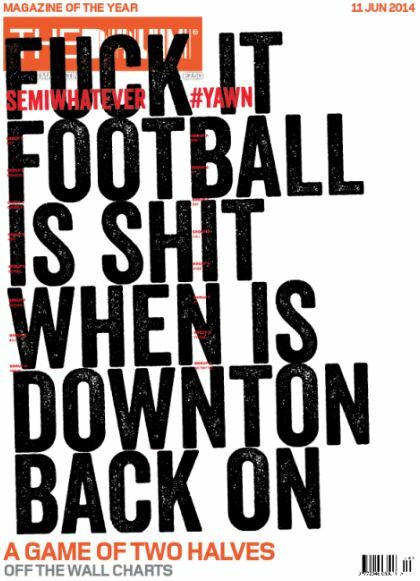 The front cover included the F-bomb, in large font, as part of a creative design tying in with the World Cup which kicks off today. (Go Belgium, thanks to my sweep stake pick). But, context aside, according to the Royal Mail, the subscription-only trade publication failed to comply with the company’s T&Cs of avoiding ‘offensive, obscene or threatening language’. So, knowing what I know now, I’m not sure why I was surprised to read again today that there are reports of postal staff – possibly Royal Mail, possibly not – refusing to deliver a special edition of The Sun in the North West. A blow to the UK’s largest newspaper after it invested in creating a one-off paper celebrating ‘Englishness’ to celebrate the launch of that football tournament. There’s a pattern emerging here, don’t you think? Reaching 22 million people across the UK and not a Page 3 model in sight, The Sun had already pre-empted a negative reaction from Liverpool, so decided against distributing there, as a result of the newspaper’s Hillsborough football disaster coverage. But, reports are circulating that elsewhere in the North of England – including Runcorn, St Helens, Skelmersdale and Ellesmere Port – that postal staff wouldn’t agree to deliver in these areas if asked. At a time when the print journalism industry is struggling to stay alive, because consumers are choosing to eat their news and views in more convenient digital bites, I’m surprised that delivery companies like the Royal Mail are turning their back on print partners. Surely, these corporate contracts – whether they’re one-off projects on long-term – are their bread and butter. And, without them they’ll just go hungry! Particularly if their hunger pangs come down to language preference, like in The Drum’s case. It’s for the end consumer to make the complaint and, if they’re offended, the issue (no pun intended) should be taken up with the company responsible: the publisher, not the carrier. FIFA has enough PR problems to deal with around this global event, besides whether its ‘brand’ can even be delivered to the right people. It needs to focus on protecting its image against rumours that half-built stadiums will be half empty, as well as the news that the Brazilian army has been asked to drive lingering drug lords out of local favelas. Let’s hope these latest Royal Mail fails don’t reflect too badly on the tournament. *That bad joke proves I am my mother’s child, just in case anyone was wondering.